With the removal of the federal government to Philadelphia in 1790, Federal Hall returned to housing the municipal government until 1812, when the current City Hall on Park Row was completed. The old Wall Street structure was razed and commercial buildings occupied the site until 1833, when construction began on the U.S. Custom House, the present-day Federal Hall National Memorial. The building remains one of the great landmarks of 19th-century American architecture. From its establishment in 1789, the U. S. Customs Service levied taxes on imports and ship tonnage and was the major source of federal revenue until the establishment of personal income tax in 1913. Completed in 1842, the new Custom House was an imposing Doric temple, an American Parthenon, set atop a tall base and flight of granite steps designed by architects Ithiel Town and Alexander Jackson Davis. While the exterior has remained unchanged, save for the addition of a statue of George Washington in 1882, the interior has experienced many remodelings. Operated as the Customs House until 1862, the building served as one of six U. S. Sub-Treasury locations until 1920 and held millions of dollars of in gold and silver in its vaults. In 1939, it was designated a National Historic Site, and today it operates as a museum under the National Parks Service. Another treasure of American classicism is the second Merchant's Exchange at 55 Wall Street, built to replace the first exchange which had been destroyed in the Great Fire of 1835. Completed in 1846, the design by architect Isaiah Rogers boasted a colonnade of a dozen colossal Ionic columns that disguised the three stories within and the central domed rotunda. 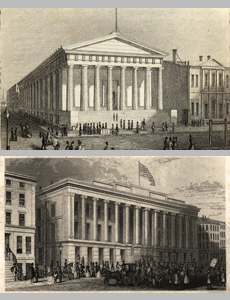 Occupying the entire block on the south side of Wall Street between William and Hanover streets, the exchange served as the major venue for buying and selling commodities, the offices of many prominent shippers, merchants, auctioneers, and brokers, as well as the meeting place of the precursor to the New York Stock Exchange. The Customs Service relocated to the building in 1862, and an expansion in 1901-10 by McKim, Mead & White for the National City Bank added the second colonnade to the facade and a grand banking hall. In 1862, the Customs Service relocated to 55 Wall, occupying it until the end of the century when the building was sold to National City Bank, which commissioned architects McKim, Mead & White to expand the building and redesign the interior. The architects doubled the height of the building, adding four stories within and an upper colonnade of Corinthian columns on Wall Street, and created a spacious cruciform banking hall.